As the title suggests, I haven’t played a single title of the Kingdom Hearts series. If you’re looking for an in-depth review or is someone that is loyal to the franchise, this ain’t the review for you. I heard of this game from a close friend who also play games, and I thought to myself, “why not?”. At the point of writing, this game is available on the Apple AppStore and Android Play Store in North America, Europe and Australia. SE and Disney have announced that the game has been downloaded 2 million times within the first month of release. It is roughly 50MB to download the app, but it will take approximately 1.3GB after the game downloaded all the assets. After downloading the game, it didn’t take me long to like the game and sink deep into the game. 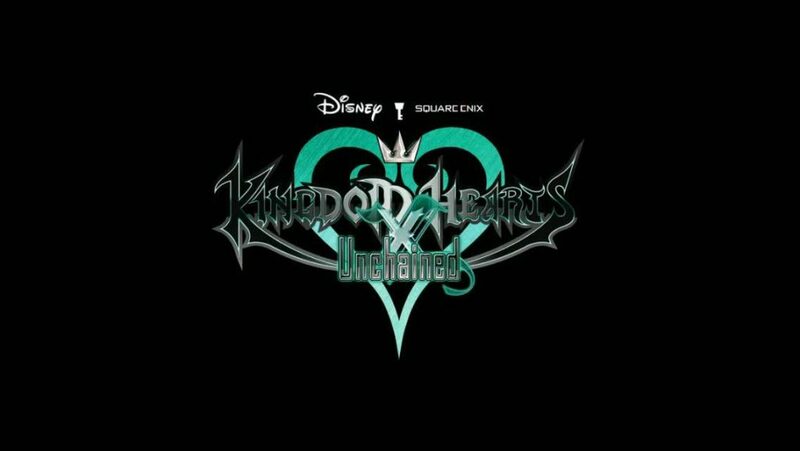 Kingdom Hearts Unchained χ(chi) is a free to play (f2p) game released by Square Enix (SE for short). It is a prequel to the whole Kingdom Hearts series, set 100 years before the events of Kingdom Hearts. You play a keyblade wielder who joins one of 5 factions led by Keyblade Masters who are fighting for control of the limited light in the world. The game’s titles refer to the legendary χ-blade (chi-blade), a weapon that is central to the series’ story. The game was designed as a playing experience that newcomers (like me) to the series could come to, as mentioned in a message from Tetsuya Nomura. Both Tetsuya Nomura and Yoko Shimomura, veterans from the main series, returned as director and composer respectively. I must address the background music particularly because, the music moves me, even though I have no attachment to the Kingdom Hearts series (play with your earphones on, you’ll thank me later). From day 1 I found that this game exceeds my expectations when comes to mobile games. Prior to this, I would only play games that are easy and fast, like Angry Birds, Bejeweled or even Tetris. I don’t play action games or RPGs because of the unease of playing with a touch screen (I’m looking at you, Mobius Final Fantasy). It is worth noting that this game is very different from the series that are made available on consoles. The game uses 2D animations for its look while the actions are based on swipe and tap movements on the touchscreen. Kingdom Hearts χ is a role-playing video game set in the universe of Kingdom Hearts which includes original characters and locations as well as ones from the Disney and Final Fantasy universe. Seeing characters from my childhood where i was Remote Control Shogun on Saturday mornings engulfs me with a sense of nostalgia. With the frequent weekly events, it’s not unusual to see Zootopia or The Jungle Book medals. More on this will be explained further down. 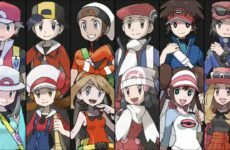 The game starts off with you creating your own unique character. 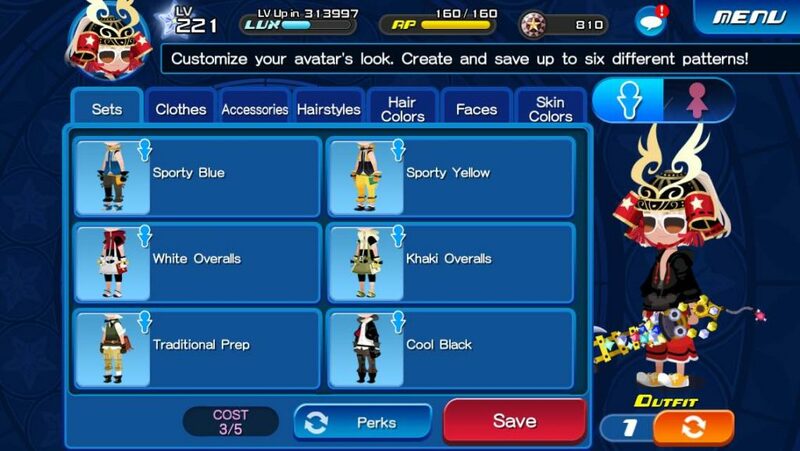 You can customize the gender, hair, and clothing, and choose accessories themed after both Square Enix and Disney universe characters present in the Kingdom Hearts series. After a certain amount of the available content has been completed, new story missions and avatar boards become available. At the moment, it seems that 25 new story missions will be released twice per month. The game’s attacking mechanic is very simple, tap enemies to deal single attacks, swipe to deal group damage or swipe the medal to deal special damage. 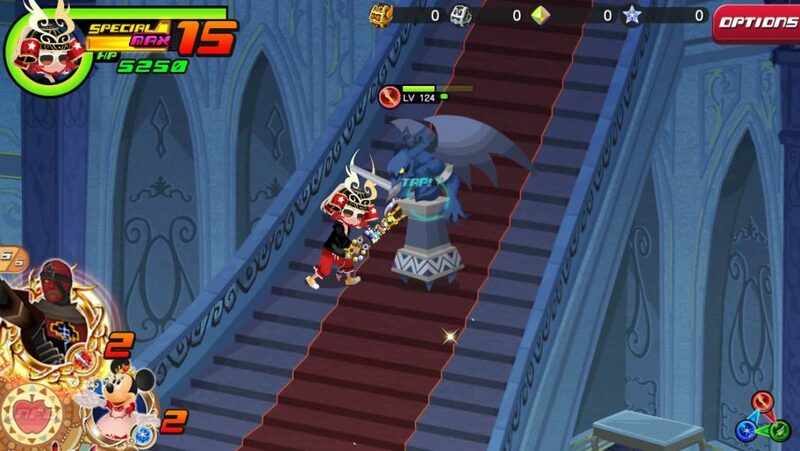 By dealing special damage, the player will use their “SP” but it can be replenished simply by attacking more heartless or opening treasure chests. Playing quests use up AP, which can be replenished by either waiting a certain amount of time or using by using the in-game currency, jewels. Alongside the single-player mode, there is a multiplayer mode where teams of players work together to take on Raid Bosses, gigantic Heartless with high HP and ridiculous 1-hit-KO attacks. Another element to the game is that you will have access to multiple keyblades, each with 5 slots for medals. Medals are separated into 3 types, namely, Power, Magic and Speed. Like rock-paper-scissors, they are weak to one and strong to the other. Players start off with one keyblade while unlocking more keyblades as they progress through the story missions. For me, I play by equipping the medals that compliments the keyblade. This enables me to yield the highest possible damage output to my enemies. Although, it is important to note that not all 5 medal slots would be accessible from the beginning. You start with 3 slots, and unlock the other 2 gradually as you level up your keyblade using materials collected during your missions. 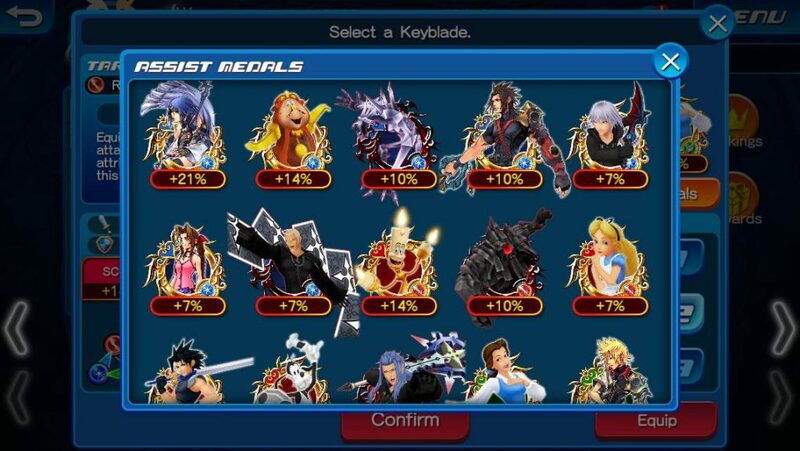 Leveling up your keyblade also increases the damage multipliers for your medals. Now that I caught up to the story quest, I play the other quests such as event, coliseum and special quests. Coliseum quests are a true test for a player’s tactical skills and medals. Players fight to rank up above the rest for prizes before the monthly refresh. Special quests are daily refreshed, it includes quests that gives upgrade materials. Event quests are subjected to availability, they quests may include high score challenges, raid missions and so on. For our time zone (GMT+8), the game refreshes at 3pm everyday. 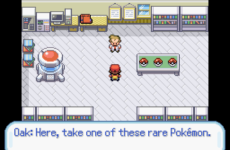 However, no matter how much i love this game, there are times where I can’t help but to think that the game developers (SE I’m referring to you) is in desperate attempts in making players spend actual money by purchasing the ingame currency, jewels. I say this because lately, certain quests may require specific medals to fulfil a certain goal. To illustrate this, I need to talk a bit about a mission, for example, standing in front of you is Cerberus, and one of the mission objective is to defeat it within one turn (1 turn triumph), and you can see 3 life gauges underneath the main HP gauge. You use all strong medals that you have and used all the special abilities, only to find Cerberus is not down. 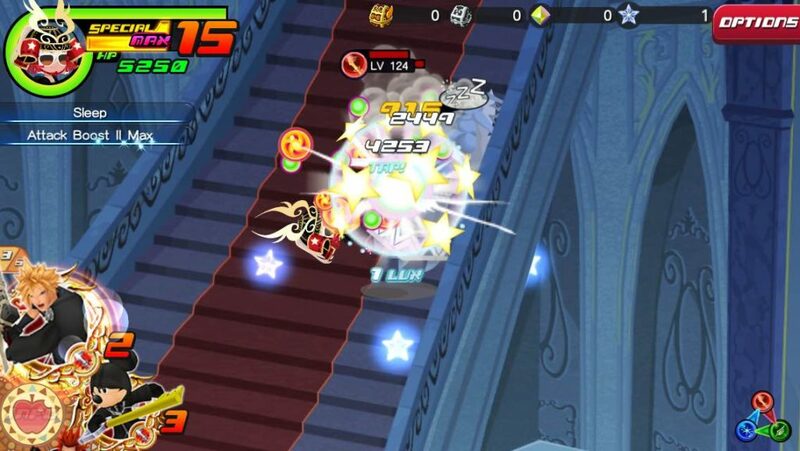 You could use medals such as Vivi that increase the Strength of upcoming medals, or you can do that more efficiently with a Namine medal, that copies the effect of the target, or even an Alice medal, who will cancel off the effects of the target. However, I must point out that the pull rate for Namine and Alice is very low due to the overcrowded medal pool, making it not worth it for players to pull. This can be real frustrating especially if the mission objective reward carries a certain amount of importance. Another example will be the High Score Challenge events, which will have a preset list of medals that grant bonus percentage on top of the damage points that players dealt, a f2p player will normally have little or none of the bonus percentage because most of the case, the high percentage are on premium medals. 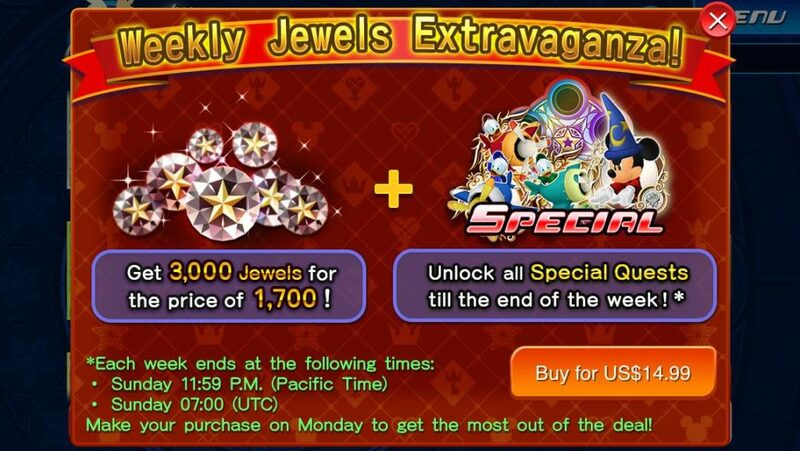 Despite this, I have to point out that it is possible to play the game without paying, by completing 25 story quests, you would be able to get 750 jewels, while daily log in jewels will end up being 500 in a week. From time to time, there will be daily jewel missions that will give 200 jewels upon completion of the mission objectives. Story wise, the main character goes from one place to another in helping to rid of the heartless. After a few arcs, sometimes it can be repetitive. 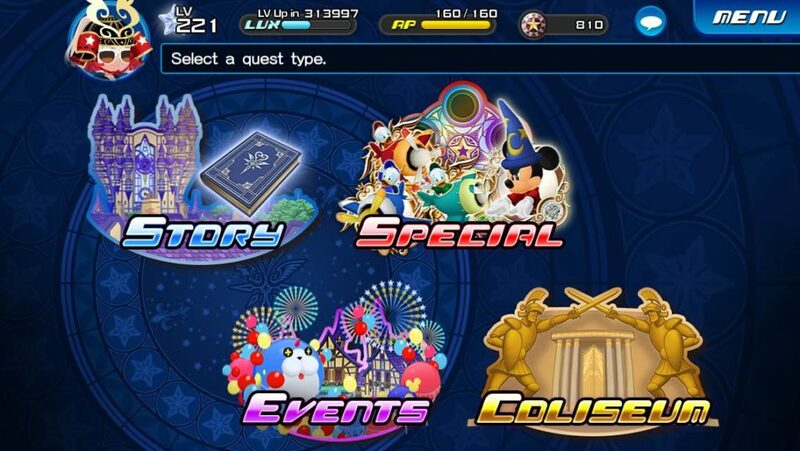 However, I noticed that the newer missions has brought better, more in-depth story which made me ask questions like “what will happen to the main character next” or “what are the keyblade masters hiding?” Instead of the usual “how long more should I do this before I have enough jewels?”. Overall, I find it a very good mobile game, with simple action mechanics, enough depth in the story. I sense that in terms of story, it will bring more questions than answers in anticipating the release of Kingdom Hearts 3 on PS4 and Xbox One. OPEN LETTER to SQUARE ENIX: Seeing that next year is Kingdom Heart’s 15th anniversary, please have a remaster ready for the current gen consoles. I don’t want to resort to emulators to play them and I am way past the 4:3 ratios.